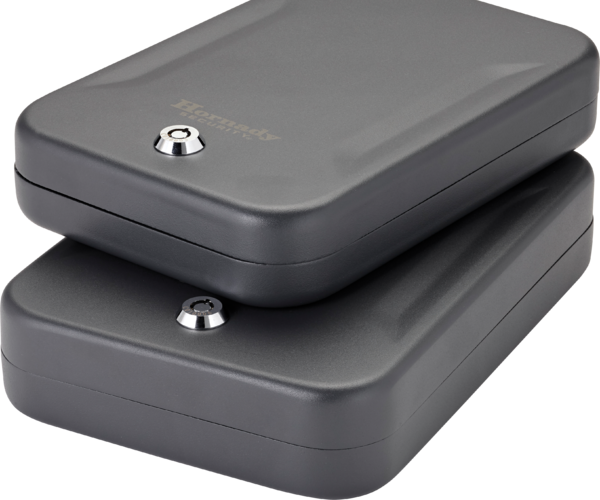 Hornady Security® Lock Boxes provide secure storage for handguns and other valuables at home, on a nightstand, in the car, or when traveling. All Hornady Security® Lock Boxes come with a heavy duty 1500 lb. rated steel cable that secures to any stationary object including a vehicle seat or heavy piece of furniture. The patented, space-saving receiver of the cable allows maximum storage space inside the box. Lock Boxes also provide security for concealed carry permit holders. Reliable steel barrel lock opens smoothly and comes with two keys. 4-foot steel security cable withstands up to 1,500 pounds of force. Patented space-saving cable receiver allows maximum storage inside box. Durable 16-gauge steel housing protects against pry attempts. Premium foam interior cradles and protects valuable contents. L: 9.5" x 6.5" x 1.75"